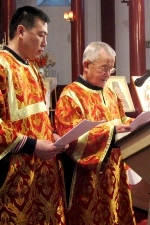 The missionary movement associated with Fr Daniil Sysoyev is promoting a number of cultural and religious initiatives among Chinese students in Russia. Fr Sysoyev is the Orthodox Russian Orthodox priest who was shot four times and killed by an unknown gunman in his Moscow church last November. A guided visit to the Monastery of Saint Sergii for Chinese residents in Moscow was one of the first steps taken by the “Prophet Daniil movement”. said theologian Yury Maximov, leader of the movement. “For this reason, we thought about all possible ways to further missionary work among foreigners living in Russia. In the end we decided to bring them closer to our religion by organising trips and tours in our monasteries, in their language,” he added. The movement’s founder, Fr Daniil Sysoyev, had already approved the initiative before his death. Known as the ‘Russian Salman Rushdie’ for his strong views against Islam and religious extremism, the young clergyman was himself the victim of a Muslim fanatic. Consequently, the ‘Prophet Daniil movement’ is already planning new initiatives, such as reading religious texts in Chinese.